Iris histrioides 'Katharine Hodgkin' teased into bloom. MAY DREAMS GARDENS, IN - Winter teased Spring again with sunshine and warm temperatures. 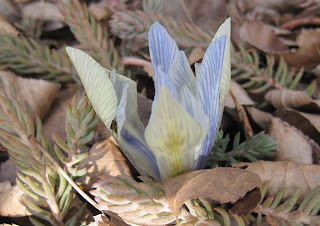 In the aftermath, Spring allowed an iris, Iris histrioides 'Katharine Hodgkin' to bloom even though it is only mid-February. The gardener in whose garden this teasing took place commented, "I can't control the seasons, obviously, but I do enjoy the results of their antics. This little iris is blooming about five or six weeks earlier than normal." When informed of the early blooming iris, other local gardeners in general concurred that it was far preferable to have Winter tease Spring and trick its flowers into blooming early with warm temperatures, than for Fall to mess around with Summer and perhaps shorten the growing season with earlier than normal cold temperatures. However, most gardeners said they were not personally going to fall for the antics of the seasons and would stick to their usual planting schedules. They planned to keep the tradition of planting peas on March 17th and other cool season vegetables like lettuce, radish, and spinach a week or so later. "The biggest problem with all this weather tomfoolery isn't the early blooms", noted Dr. V. Q. Hortfreud, who specializes in the study, diagnosis and treatment of the anxieties of gardeners. "Those blooms are a nice surprise in February, though a bit freaky. The biggest problem is that the winter growing weeds are really taking advantage of the mild weather and no one is paying attention to them. Not only are they quite large for this time of year, but some are even starting to produce flower buds. I suspect if these weeds aren't controlled, my business is going to increase significantly as gardeners seek treatment for the anxiety and distress these weeds can cause for them." Local authorities are advising all gardeners to look out for these weeds, even as they look for more early blooming flowers, including irises, that may have been teased into even earlier bloom. The weeds should be easy to spot and should be pulled as soon as possible, in accordance with Loudon's Rules of Horticulture, Rule No. 7. For those who don't get the weeds under control, Dr. Hortfreud said she will be providing extra counseling sessions, as needed. Group therapy is also available for anyone who wishes to discuss the freaky February weather and what happens when Winter teases Spring. Updated Monday, February 20. A local gardener, who wishes to remain anonymous, went back to the garden where the weather tomfoolery is occurring and observed that there were four additional iris blooms present on Monday afternoon. Local authorities were notified. Ms. Katharine is quite a looker, in full bloom here in Zone 7a SE TN, as well. But this is the norm for us, if just a wee bit early. For you, however....but didn't your Zone change? Who knows what is the normal anymore? The weeds do, that's who! What a great little gift to find...just what the winter weary (if you can be winter weary after a mild winter) gardener needs! Ooooh. Gotta get me one of those-------or possibly several! We had a really mild winter this year. We didn't get snow until mid January and temps have been all over the place since. The next few days are calling for 5C highs. The snow is almost gone and I'm thinking spring is just around the corner. I am so happy to see your Katherine H. as I have planted 50 and should be just weeks behind you. Thanks for the update!